Willrich cares how information about you is used and shared, we appreciate your trust. Willrich gathers only the information specific and required by your order. We do not sell or use your information for any other purposes.”Cookies” are alphanumeric identifiers that we transfer to your computer’s hard drive through your Web browser to enable our systems to recognize your browser and to provide features such as a shopping cart. This site requires that they be turned on. While Willrich Precision Instrument Co. provides the information on this server to anyone, we and/or the original copyright holder retain copyright on all text and graphic images. This means that you may not: distribute the text or graphics to others without the express written permission of Willrich Precision Instrument Co. and/or the original copyright holder; “mirror” this information on your own server without our permission; modify or re-use the text or graphics on this system. You may: print copies of the information for your own personal use; store the files on your own computer for your personal use only; reference this server from your own documents. Willrich Precision Instrument Co. reserves all other rights. Product and service names profiled herein are marks of Willrich Precision Instrument Co. Other manufacturers’ names and logos are trademarks of their respective companies. The information, text, graphics, and links provided herein are provided by Willrich Precision Instrument Co. as a convenience to its customers. Willrich Precision Instrument Co. does not warrant the accuracy, or completeness of the information, text, graphics, links, and other items contained on this server or any other server. Prices on this site are subject change without prior notice. Prices reflected on this site are based on credit card purchases only. 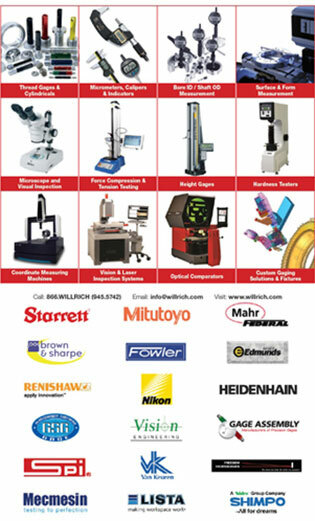 Willrich Precision offers a wide variety of products from many manufacturers and suppliers. We make every effort to keep prices on our website up to date based upon information provided by manufacturers. Occasionally purchases are made on our site which are subject to pricing mistakes due to incorrect data from the manufacturer or data entry errors. If this happens a representative from our company will notify you immediately to provide you with correct pricing . We maintain the right to refuse to sell a product which is priced incorrectly. However, we will offer you a discounted price or an alternative product offering for your consideration. Due to the large number of products offered by Willrich Precision the large majority of products on our website are not held in inventory in our own warehouse. Most products are shipped from the manufacturer (directly to you whenever possible). Please note: Some manufacturers require that items are shipped to us and then in turn we ship to you. (no double shipping charges to you). We make every effort to deliver products to you as soon as possible and available. We do our very best to provide you with an accurate expected date of delivery. Items may be available at time of quotation (manufacturer’s inventory) but are subject to prior sale. Deliveries quoted do not include shipping time. The materials on Willrich Precision’s web site are provided “as is”. Willrich Precision makes no warranties, expressed or implied, and hereby disclaims and negates all other warranties, including without limitation, implied warranties or conditions of merchantability, fitness for a particular purpose, or non-infringement of intellectual property or other violation of rights. Further, Willrich Precision does not warrant or make any representations concerning the accuracy, likely results, or reliability of the use of the materials on its Internet web site. In no event shall Willrich Precision be liable for any damages (including, without limitation, damages for loss of data or profit, or due to business interruption,) arising out of the use or inability to use the materials on Willrich Precision’s Internet site, even if Willrich Precision orallyly or in writing of the possibility of such damage. Because some jurisdictions do not allow limitations on implied warranties, or limitations of liability for consequential or incidental damages, these limitations may not apply to you. Any claim relating to Willrich Precision’s web site shall be governed by the laws of the State of New Jersey without regard to its conflict of law provisions. General Terms and Conditions applicable to Use of a Web Site.